We are just back from another great PCGS Members Only show in Las Vegas. It’s a small affair but offers great camaraderie, excellent food and is a terrific opportunity to buy/sell or just talk about coins. All PCGS Collector Club Members and PCGS Dealers are welcome. Included in this eCollector is a short video that we shot at the show. The video is the first of a series designed to answer your questions on a particular issue. If you have a topic or a specific question that you would like discussed in a future video please send it to us at [email protected] and include "Ask Don" in the subject line. 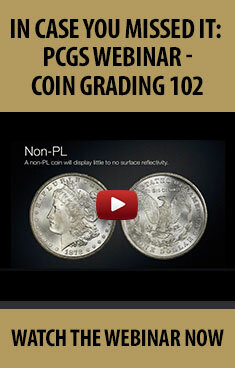 This video’s topic is the new PCGS Reconsideration service that has proven to be very popular. We hope you find it useful. Monetary value aside, if you could own one of the coins from the PCGS Ultra Rarities Index, which would it be? Participate in the PCGS Newsletter Survey and you could win a $10 2000 PCGS BU Liberia Type 3 valued at $50.00. PCGS announces the Ultra-Rarity Index, a 44-year price history of the ten most famous U.S. coins in numismatics. Plus, as an added bonus, you can download free the full-color Ultra-Rarities Index brochure, which contains charted values, recorded sales and auction results, and high resolution images of these famous coins. The 1907 High Relief $20 Gold Piece was designed by the noted American sculptor Augustus Saint-Gaudens at the request of President Theodore Roosevelt. "High Relief" refers to the depth of the details which, on this coin, are much deeper than usual, giving the coin an impressive medallic appearance. "High Reliefs" come in several varieties: the extremely rare Ultra-High Relief and the more common Flat Rim and Knife (or Wire) Rim variants. The Wire Edge on some of the regular-issue High Reliefs is more of a striking anomaly than an actual variety, although they are collected as such. During the striking process, extreme pressure forces the metal of the planchet into all the recessed areas of the dies. If the diameter of the edge collar exceeds the diameter of the die, a wire edge will encircle the coin. If the die is misaligned relative to the edge collar in any direction, a wire edge will be created wherever there is a separation between the die and the edge collar. The High Relief version of the Saint Gaudens $20 proved impractical for mass production and a lower relief version with Arabic numerals in the date was produced later in 1907. Saint-Gaudens' obverse design was considered so beautiful and so popular that it was re-used on the gold bullion coins struck by the U.S. Mint beginning in 1986. The world is going mobile and numismatics will be no exception. Having the most accurate and current coin information and data at your fingertips – no matter where you are - can take a collection from good to great. PCGS Director of Application Development John Nelson gives an inside look at the PCGS mobile apps that can make you a smarter, more well-informed numismatist. Assigned to train the new Shanghai office staff on the operations of PCGS numismatic photography, PCGS’s Chris Thomas spent ten days abroad in the world’s most highly populated city. Chris recounts his experience photographing both the coins and the people of China. The Premium Internet Auctions are similar to Regency Auctions, but with the number of lots limited to between 100 and 250 graded coins. This 116 lot sale, being held at www.legendmorphy.com contains a number of spectacular coins, all of which are being sold unreserved.